Karen Baldner: "The inspiration to my work is the duality of the human condition. What fascinates me is the seeming paradox of opposites, dichotomies of all sorts living side by side: brutality and beauty, grace and grotesguqe, replusiveness and dignity. In my work each new piece is a kind of alchemic act towards living with this paradox. 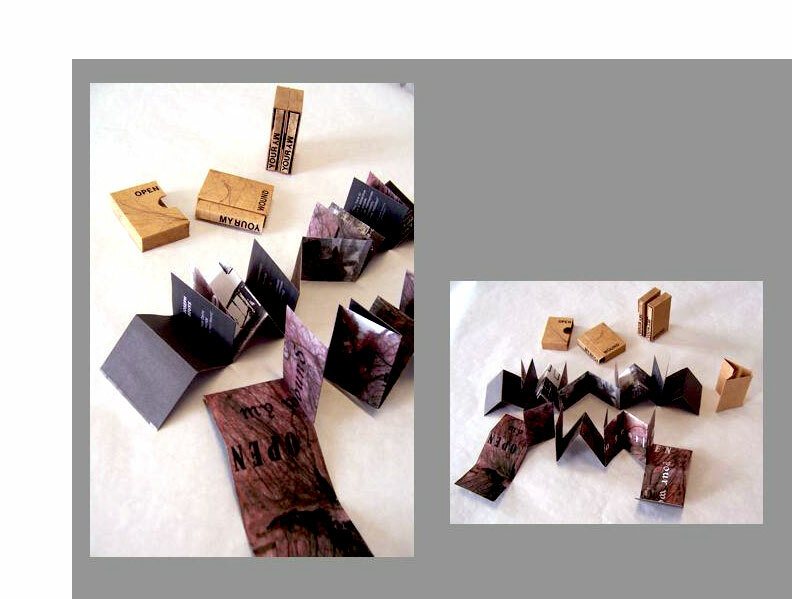 "My interest in bookmaking was originally inspired by my activity as a printmaker during my graduate school years. As the print is composed of many layers which ultimately comprise its final state, the book can pick these states apart and honor each as a separate page while still allowing for a composite reading. I always felt that printmaking positioned itself uniquely between a two and three dimensional sensibility and with this kind of a penchant inside me I felt drawn to the book as a medium which was able to expand this quality with the potential for also moving into the dimension of performance. However, what ultimately kept me interested in the book format was its structural resemblance to the human body and the consequent metaphoric potential of this resemblance: its symmetry, pivotal movement around an axis, its ability to hide and reveal its content, its vulnerability and its resilience to onslaughts to its existence throughout history." Bloomington, Indiana / St. Mary's City, Maryland: Karen Baldner / Bjorn Krondorfer, 2010. Edition of 20. 5 x 16.5"; 42 pages. Letterpress embossed with 42 point Bulmer, Italic, and 36 point Courier fonts. Colophon and images digitally generated. Handmade cotton rag paper with horse and human hair. Sewn onto double raised cords with light green felt over boards. Bound as a traditional medieval girdle book. Metal clasp closure. This bookwork is one in an on-going collaboration between Baldner and Krondorfer. Jewish/German Dialogue Project by Karen Baldner and Bjorn Krondorfer, Project Statement: ""How do two Germans talk to each other in a post-Shoah [post-Holocaust, or, more literally, post-Calamity] world if they come from a Jewish and a non-Jewish family background? We explore this question not only through verbal conversations but substantially through the language of the visual arts. Together, we have created works of art that take on the medium of the book, a format rooted in the German and the Jewish traditions. Our book-objects are not only catalysts for the deepening of our dialogue, but they also witness our intensely personal and artistic process. As objects, our art also invites the audience to participate in our personal conversations: In the face of the post-Shoah chasm between our communities, can we imagine spaces where genuine dialogue can take place? "Our work emerges from the intimate sharing of our family histories. It is the interpersonal and subjective dimensions that enable us to render the past as present as our living experience in the 'here and now.'" About wit(h)ness, Karen Baldner: "This book is about the process of integrating the Shoah into our respective lives, a responsibility to navigate carefully between remembrance and respectful distancing. As we witness each other's struggles across our respective differences we do not wish to lose sight of wanting to live life joyfully, in spite of the burden of history. The girdle book format allows for an element of weight as the book is carried on a belt in the folds of one's clothing. Is it possible to enjoy life when aware of such trauma? Is it permissible to create distance from the past to live in the present with joy? We explore these issues cautiously, inviting the reader to trace the ghost-like text with all of her or his senses." The subtle back-and-forth across the white pages striated by hair foregrounds the delicacy of the task – to be grounded in reality but animated and elevated by possibility, here witnessed and revealed by art. Bloomington, Indiana: Karen Baldner, 2007. Edition of 10. 2 x 2.75"; 12 pages. One sheet book. Maze structure. Digital image and text. Printed on card stock paper. 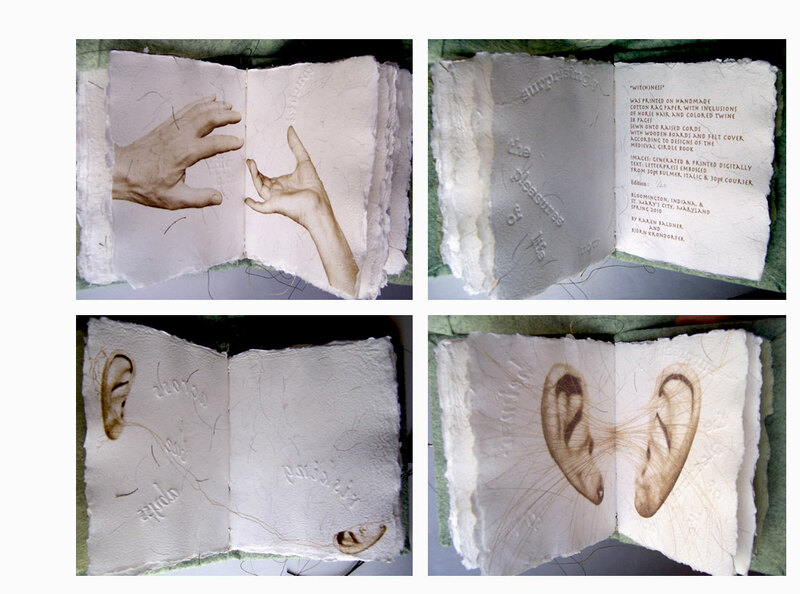 With wrap-around cover and slipcase of handmade paper with hair inclusions. English text except for one quotation in German by Joseph Beuys. The allusion is to Joseph Beuys' "Show Your Wound," a massive arrangement of hospital beds first staged in 1974 in a Munich underground passage. Karen Baldner: "Homage to Joseph Beuys, who continues to be an inspiration for being German today." Bloomington, Indiana: Karen Baldner, 2003. Edition of 10. 13.5 x 11 x 10.75"; 4 head casts. 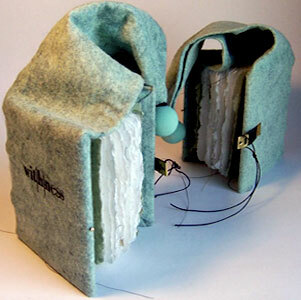 Sculptural book. 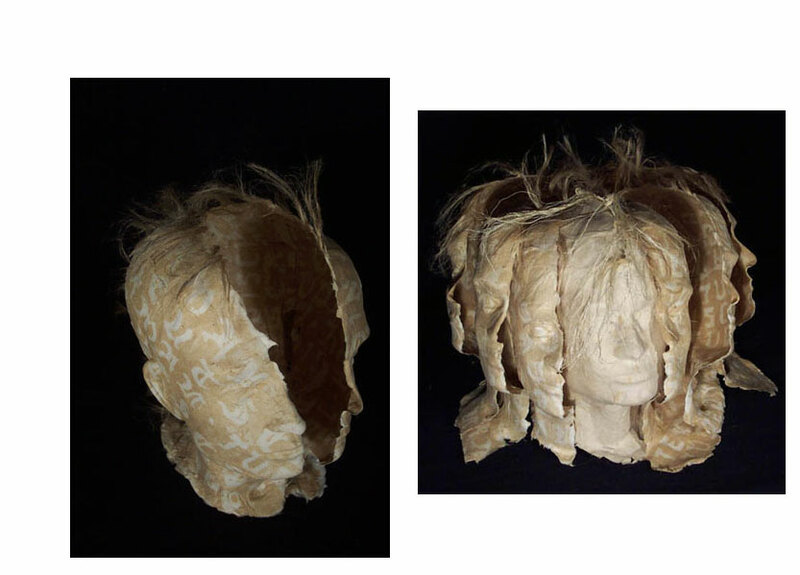 Pigmented handmade paper, cast from a plaster cast of the artist's head. 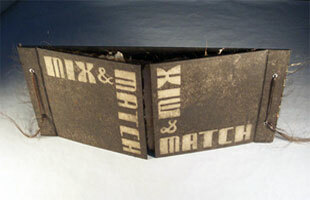 Inclusions of sisal twine and stenciled text. Housed in 13.5 x 10.75 x 11" orange silk box with paper title label on lid and bone-and-bookcloth closure. Dropdown side for retrieving sculpture. From the artist's website, Process: German/Jew: "The casts are made from couched sheets that are laid tightly onto plaster surface. 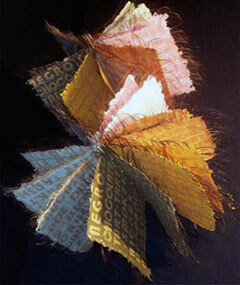 Sheets are formed from a white base layer with embedded twine and a layer of tea-stained stencils on each side. The sheets are pressed before applying stencil to second side. Sheets are pressed again after second side is stenciled with text. They are then laid onto plaster cast and patted firmly onto its surface. "Four sets of half portraits (left and right side of head) are cast for the entire book. 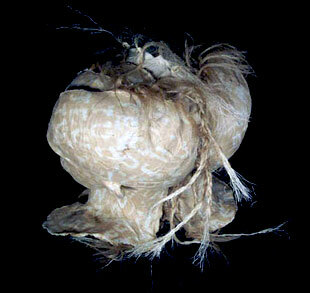 The embedded twine is used for assembling the book structure at the back of the head through braids." German/Jew is made of four hollow paper heads, one on top of the other. The heads wee molded from a plaster cast of the artist's head. The innermost head is whole while the other three are split down the face and overlay or wrap around the inner head. Because the three casts do not close (that is, meet to give a seamless look) the sculpture gives the effect of multiple personalities, or at least layered dimensions, of what may seem a single entity from the outside. The words, stenciled into the paper, seem to be variations of German and Jew - repeated, colliding, and infringing upon each other. Karen Baldner: "The inspiration to my work is the duality of the human condition. What fascinates me is the seeming paradox of opposites, dichotomies of all sorts living side by side with each other in my own life, in that of others, and in the grander history of human kind: brutality and beauty, grace and grotesque, repulsiveness and dignity. In my work each new piece is a kind of alchemic act towards living with this paradox." Here the paradox and the difficulty of being German and Jew are foregrounded. Bloomington, Indiana: Karen Baldner, 2003. Edition of 2. 10.75 x 13.625"; 24 pages. Paper handmade from pigmented abaca with inclusions of human hair and stenciled text. Hand drawn text done with a white/gold ink pen. Circular piano hinge binding using wooden skewers. Housed in orange cloth clamshell box with inset paper title label. "Each page is forged in two tonalities descriptive of a certain skin color with matching stereotypical human hair embedded into the paper edge. Text stencils within each page describe the respective race. The words 'homo sapiens sapiens' are hand stenciled across every second page." Bloomington, Indiana / San Francisco, California: Karen Baldner / Drew Cameron, 2017. Edition of 20. 12.75 x 9.5"; 10 pages. Letterpress and silkscreen. Handmade paper from combat uniforms. Piano hinge binding. Cover text pulp printed. Numbered. Karen Balder: "In War 1940- is a collaboration between artists Karen Baldner (CBAA member) and Drew Cameron, who directs Combat Paper, an organization that was founded in 2007 as a way to connect returning veterans with their communities through the paper-making process. 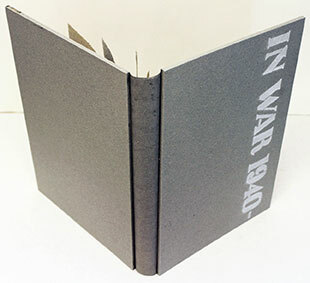 "In War 1940- is a 3-folio, six page piano hinge binding. 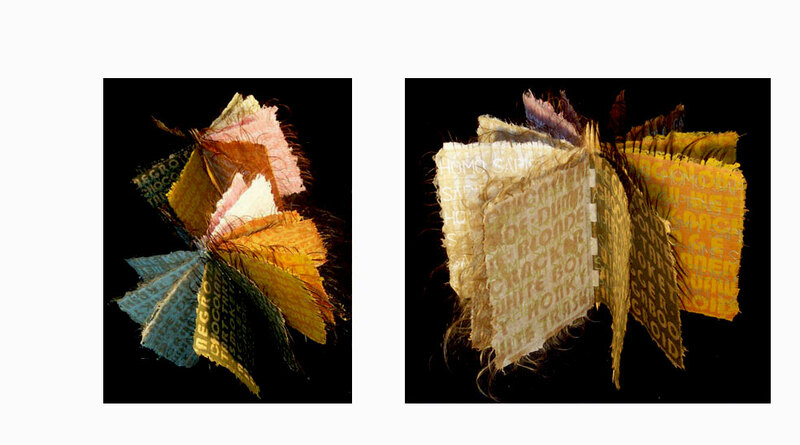 Each page represents a conflict the US has been engaged in since and including World War II and is handmade from pulp of shredded uniforms pertaining to its respective conflict. The conflict that contributed to the paper that formed each page is printed on its back. The pages are held together with dowels and attached to a hard cover. Pages are consecutively smaller with the largest page representing World War II and the smallest page representing Afghanistan. The stepped piano hinge structure allows pages to be visible simultaneously and in relation to each other. 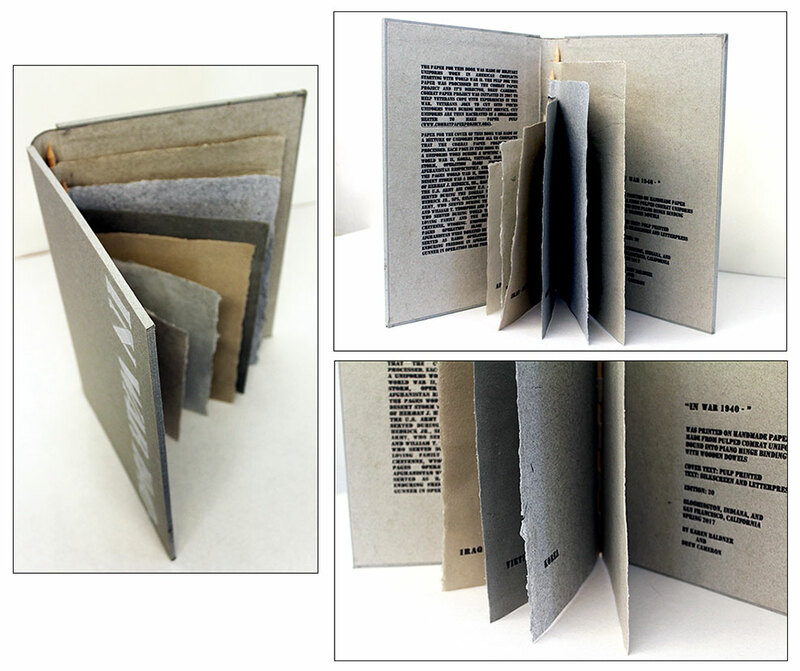 Cover and inside lining are made from a paper pulp mixture of uniforms from all US conflicts represented in the book. 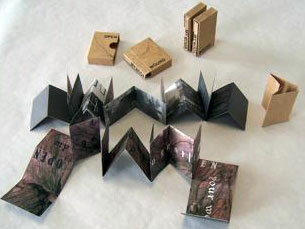 "The project is an effort to comprise the work of Combat Paper into a tangible, comprehensive object. 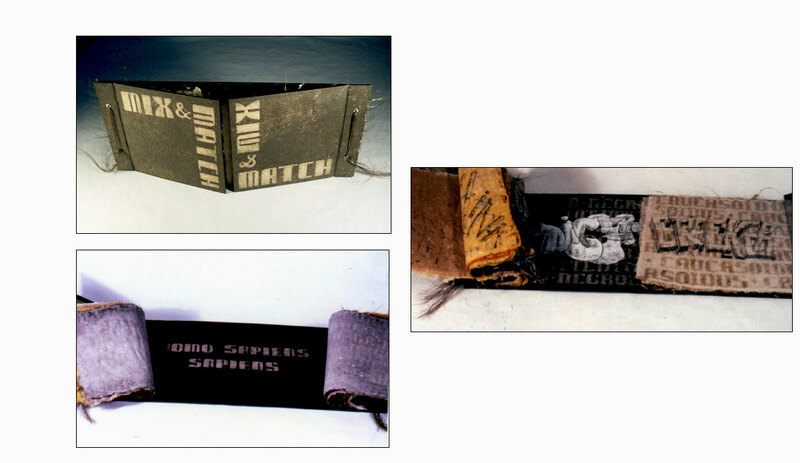 Although Karen and Drew were the main organizing agents in making this book, part of its construction was a collaboration with combat veterans who donated uniforms and cut them into pieces for the pulping process. "In War 1940- was funded in part by a project grant from CBAA in 2015." Bloomington, Indiana: Karen Baldner, 2000. Edition of 2. 21.75 x 9.75 x 1.25"; 24 pages. Handmade paper from pigmented abaca. French door binding. Housed in brown cloth clamshell box with paper title label. "Each page is forged in two tonalities descriptive of a certain skin color with matching stereotypical human hair embedded into the paper edge. Text stencils within each page describe the respective race. The respective colloquial slur is hand-drawn graffiti style onto each page. All pages are gathered with horse hair into a French Door binding."